Outside, the famously measured and proportional British press is feverishly stroking its collective bonk-on reporting on the impending arrival of yet more snow and sub-zero temperatures, but inside Islington Assembly Halls, a charming but underused venue that feels adorably like a mini Brixton Academy, it’s hotter than napalm. Seriously, even our eyeballs seem to be sweating, and the reason is a full blown circus metal assault from Swedish loons Avatar. To say the band have gone all-in on the concept of new album Avatar Country on this tour would be an understatement so epic only Dwayne “The Rock” Johnson could save us. From the arrival of crown-wearing guitarist Jonas “Kungen” Jarlsby on a throne to the matching, themed guitars, regal set and regular references to the King himself, this is the very definition of committing to the bit, and while it could so easily cross the line into cheese, in reality it is pitch perfect. As if that level of dedication, the band’s enormous death metal racket and their general wild-eyed, tongue-flicking ringmaster from hell demeanor weren’t OTT enough, they also seem to have crudely rammed the entire arena set from Slipknot’s 2015 Prepare For Hell tour into the tiny confines of this charming little venue, like a hamster stuffing its cheeks for winter. With ramps ascending both sides, an imposing and grotesquely prominent drum riser and an upper gantry proudly displaying the band’s name in constantly flashing lights, it’s impossible to tear your eyes away for even a second lest you lose track of someone, giving the feel of a dam seconds away from bursting. 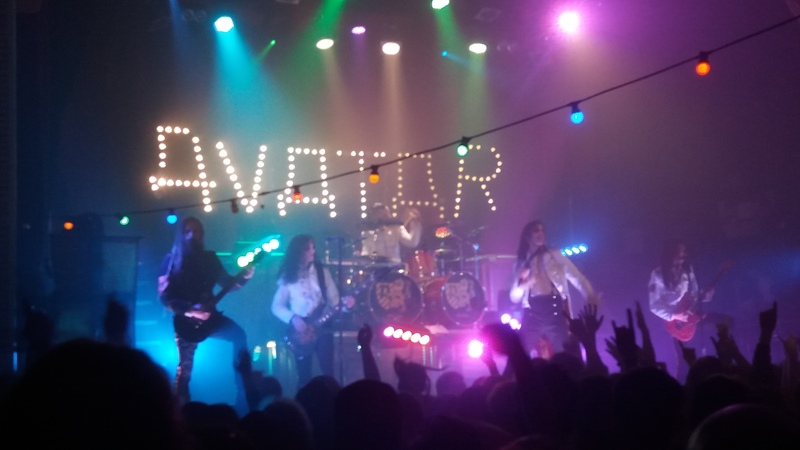 Add to that a crystal clear PA, a band playing tighter than Ebeneezer Scrooge’s balloon knot, and some Status Quo-level synchronised hair windmilling, and you have the recipe for a simply phenomenal display of everything that makes heavy metal great. Almost every song from new album Avatar Country is given an airing alongside a host of old classics and fan favourites, making for a setlist that should please even the most casual fan, ending on the absolutely ludicrous country vs death metal showdown of The King Welcomes You To Avatar Country into Hail the Apocalypse. As the evening nears its sweaty end, frontman Johannes Eckerstrom breaks character for the briefest of moments to discus how honoured they are to be in this position, humanising this most inhuman, cartoonish of bands in a way that a million meet-and-greets could never manage, and ensuring that everyone leaves on a massive high. Heavy metal is meant to be ridiculous, and pompous, and OTT, and it should be cherished as such, but this is truly on another level, the band now so deep into their own concept that its simply impossible not to be sucked in. If you are lucky enough to be in a town Avatar have yet to visit on this run, you owe it to yourself to book your place in the madhouse.